Once again, I wasn't going to attend a second con in 2012 until the late addition of Cody Schibi to Space City serendipitously occurred as I was posting his Mister Moth Comicpalooza Commission, and visited his blog while laying in links. Two of my all time favorite artists had also been scheduled, turning what had seemed like a flea market con into a rare jewel. One was Art Adams, an idol since the 1985 Longshot mini-series. 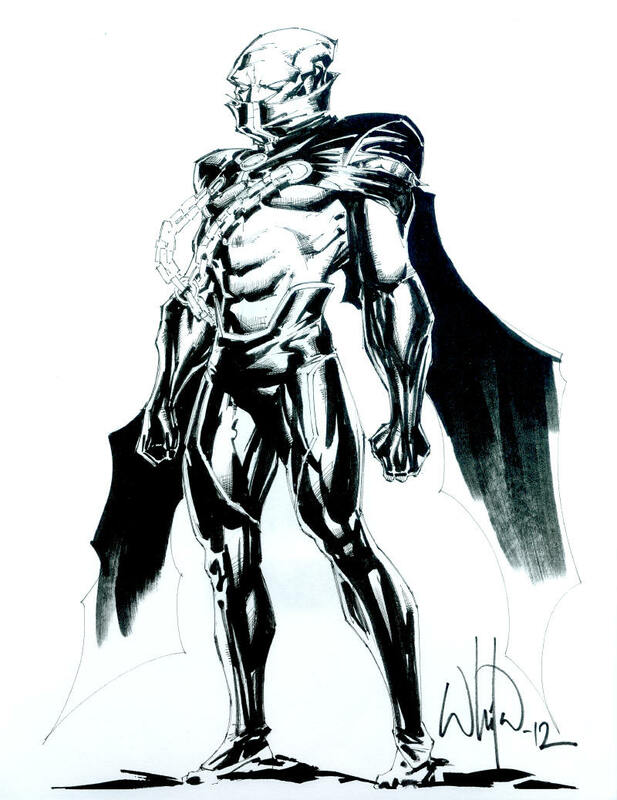 The other was Whilce Portacio, who unbeknownst to me inked Adams for much of that revelatory mini-series, plus contributed to 1986's Strikeforce: Morituri. It wasn't until he took over penciling The Punisher that I finally took notice. I had a passing familiarity with the Punisher through his guest appearances in Spider-Man books and the omnipresence of Mike Zeck imagery after his sleeper hit mini-series. Still, I didn't jump on board until the sixth issue of his solo ongoing series, lured by the siren song of a stark Mike Mignola cover and lovely interiors by Dave Ross and Kevin Nowlan. I might have just stayed for the two part story, but then I was blown away by the new art team of Whilce Portacio and Scott Williams. No one had ever quite drawn comics like that before. The intricate crosshatching, jagged feathering, angular bodies, and dynamic layouts set the tone for the Chromium Age of comic art, but to my mind was clearly better than the movement that followed. I didn't just love looking at Portacio's leanly muscled figures-- I wanted to be one of those drawings when I grew up; it became my ideal (ever thwarted by ice cream, I assure you.) It didn't hurt that Portacio's grim noir tales fit neatly into my escalating fascination with the anti-hero as role model, and the Punisher became my favorite comic book hero for a time. I collected the book until #20, for which Portacio provided his last cover after bailing on interiors two issues prior. I didn't even give a thought to why I'd suddenly lost all interest in the book, distracted by Jim Lee on the companion title Punisher War Journal. Lee was too glossy and light to suit the material like Portacio had, so I only made it a year into his run before finally losing interest in the franchise. Lee did manage to usurp Portacio as my favorite artist when Whilce took a couple of years off and Lee blew everyone away on Uncanny X-Men, but Portacio took the title back from him via X-Factor. I developed an unfortunate interest in Rob Liefeld as well. I'm sure part of that was that I couldn't draw anything like Lee or Portacio, but could manage decent Liefeld swipes. Actually, of all the hot Image artists I favored back in the day, only Portacio holds my interest when it comes to announcing new projects a quarter century later. It feels like he's still striving as an artist, where the rest found their roles and settled. I got to the con ahead of Portacio himself, and after talking with Art Adams at the next booth over, entered initial negotiations with Portacio's representative for a commission. I don't recall the final price, but it was in the neighborhood of a couple hundred bucks for a full figure, no background. I had no idea of what I was in for once Whilce arrived, though. Portacio is bar none the friendliest and most sociable artist I've ever encountered. He chatted up Adams, other artists, and held court before anyone else in his proximity. Readers of this blog are surely aware that I'm far from inarticulate my own self, so putting us together in the same spot likely triggered a meteorological warning for insistently strong warm winds in the immediate area. God only knows how long we yapped about our feelings on the current and future state of the industry, and I pity anyone in earshot subjected to our intense deliberation. Specifics elude me 3/4 of a year later, though the internet was a central theme (Portacio crediting the e-presence of fandom with keeping hope alive, and my stating the belief that periodicals are truly dead once free web comics become the inescapable norm.) I'm still intimidated by my memories of the presences of Dave Johnson and Art Adams, but Portacio became that guy you enjoy throwing down with at the comic shop every week. Ooooh. Very, very skilled art. I love the inking, too. Nice! 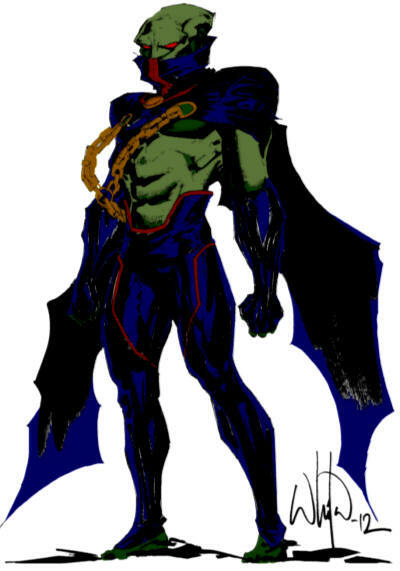 I also love that sketch of J'onn. I've seen that before and it still impresses me: the line and composition are really striking. Love how he makes the cape come alive.